Palestinian security sources said that Israeli soldiers blocked the western and southern entrances of Jenin and stopped passengers and interrogated them. Troops also thoroughly searched passengers cars and documents which cause people to cue for long hours. In addition, eyewitnesses said Israeli military patrolled the eastern part of the West Bank looking for water wells, claimed to be unauthorized. Israel does not allow the Palestinians to dig for water wells and aquifers as part of its attempt to keep control over water resources in the region. In the meantime, troops setup a military checkpoint at the entrance of the village of Beit Fajjar, south of Bethlehem and stopped vehicles in the late hours of Monday night. 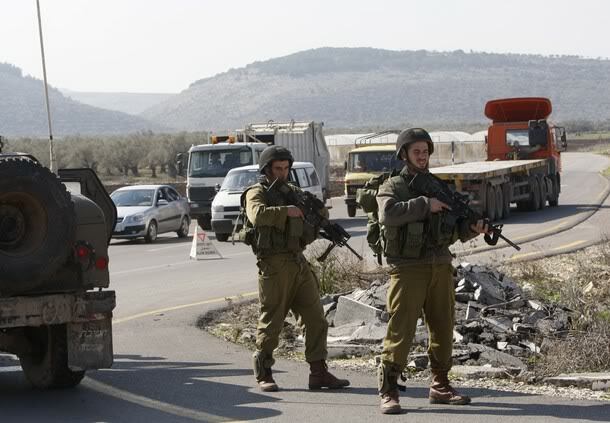 Palestinian sources said that Israeli troops arrested four Palestinians, three from Beit Fajjar and one from Hebron.